Does NYC’s Airbnb Crackdown Help Local Residents or Hotels? Is New York Cracking Down on Airbnb to Help Local Residents or Hotels? Nearly half of the 50,000 Airbnb listings in New York City are illegal, according to a study from earlier this year. Renting out your apartment while you’re away for the weekend? Illegal, under New York’s state and city laws, which are stricter than almost any others in the country. Listing the second unit in your brownstone duplex? Illegal. Even renting out spare rooms is illegal if they have separate locks for the guests. There’s no telling exactly how it will play out. Christian Klossner, the city’s chief of enforcement, says having the data will make it easier to target the worst actors, like a property-management company in Hell’s Kitchen that allegedly turned 26 rent-stabilized apartments into illegal sublets. Klossner’s staff will be able to look for patterns, like multiple listings connected to the same host. After a similar law took effect in San Francisco last year, requiring Airbnb hosts to register directly with the city, the number of Airbnb listings dropped from more than 10,000 to 5,500. Now that apartments there are in higher demand, the average daily rate this summer has been up 8 percent from a year ago, from $262 to $283, according to the independent analytics company AirDNA. As this political fight has raged in New York over the last five years, it’s often appeared to be a proxy war between two powerful business interests: the hotel industry on one hand, for which New York is the most profitable market in the world, and Airbnb on the other, which can’t afford to withdraw from New York as it prepares for its initial public offering. Airbnb claims the mayor and the City Council, which approved the bill 45-0, are in thrall to the hotels. “We are disappointed Mayor de Blasio chose to sign this hotel industry-backed bill instead of defending the needs of middle class New Yorkers who rely on sharing their home to get by,” said Josh Meltzer, the company’s head of Northeast policy, in an emailed statement. In June, the company published figures on how much campaign money certain council members had received from a powerful hotel union, which amounted to hundreds of thousands of dollars over the last five years. Smith is an ideal testament to Airbnb’s claims of helping middle-class New Yorkers. She bought her duplex in Harlem 15 years ago, eight years after coming to New York from Alabama, and now, as a freelancer in the advertising industry, she depends on income from the second apartment when business is slow. “You eat what you kill, as an entrepreneur,” she said. “There’s not always prey out in the streets to kill.” She used to rent the place out on a yearly basis, she said, but she makes far more money with short-term guests. About those studies: They’re politicized too. 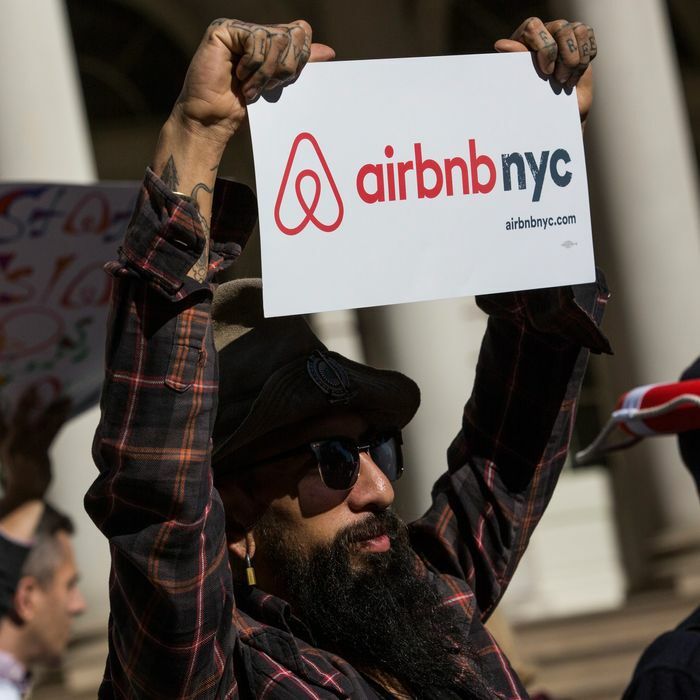 The city comptroller’s office released a report in May, finding that Airbnb cost New Yorkers an extra $616 million in rent in 2016. The company was responsible for 9 percent of the rise in rent since 2009, it said. In neighborhoods like Williamsburg, Greenpoint, and Murray Hill, tenants pay more than $100 a month in extra rent because of its presence. But AirDNA, whose data they used, later attacked the report’s methodology, saying the researchers misinterpreted the numbers. “It’s no surprise that AirDNA would attack a credible report when their own bottom line depends on Airbnb’s success,” the comptroller’s spokesperson shot back. Another report from McGill University in Montreal recently found that Airbnb has spurred a $380 rent increase for the median New York tenant, and that its benefits flow disproportionately to white hosts; even in predominantly black neighborhoods, it said, Airbnb hosts are five times more likely to be white than black. The study, however, was commissioned by the major hotel union. Airbnb collaborated on its own study last year with several NYU faculty members, including Arun Sundararajan, using more authoritative data, and found that the effect on rent was negligible. But opponents have argued that if the company were serious about gaining the public’s trust, it could release its data for independent studies — which it hasn’t done. There’s been talk of a compromise that would protect one- and two-family homes from enforcement, so that homeowners like Adrianne Smith would be free to rent out the extra units in their duplexes. Robert Cornegy, a council member from Bed-Stuy, introduced a bill to this effect in June, but so far it’s been left by the wayside. Meanwhile, the law de Blasio signed will take effect in February. Is NYC Cracking Down on Airbnb to Help Residents or Hotels?